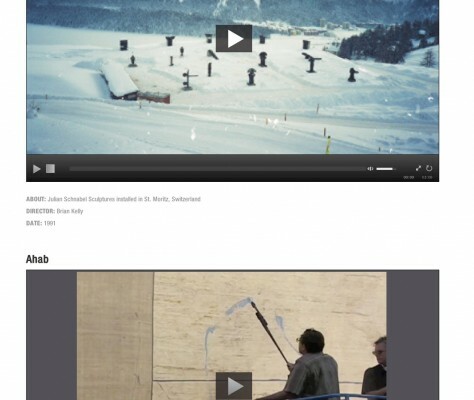 Picking up on our work with artist, filmmaker, and general man-about-town Julian Schnabel, we recently designed and developed a custom, self-hosted video section on julianschnabel.com. The new section highlights behind the scenes footage and other archival material and video art from Schnabel and company, including a short documentary, sculpture in Switzerland, and a ‘making of’ featurette for Ahab. Rather than embedding videos via a third party service such as youtube or vimeo, we designed and implemented a custom player, giving a more branded, streamlined look and feel. As part of our ongoing mission to serve artists and creatives in New York (and beyond! ), we’re thrilled to expand the growing portfolio website and online home for Julian Schnabel.